Bratislava, the capital of Slovakia, is in the shadow of its greater sisters: Budapest, Vienna or Prague. But the place is worth visiting too for its charming old town, amazing cafe scene or unique UFO-shaped bridge offering great views. 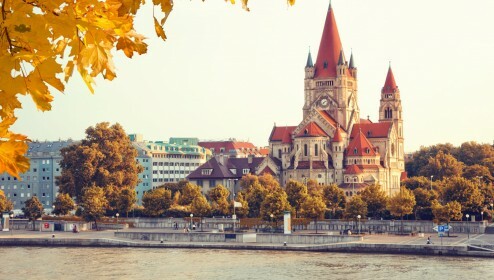 If you are wondering how to get from Budapest to Bratislava we’ve got you covered! Below you can see all the possibilities of travelling between these two capitals so you can choose the one that works best for you. Budapest and Bratislava are so close to each other (200kms only) that it would take longer to take the plane between them than any other mode of transport. But if you really insist on flying it is possible to do so with a change in Prague. 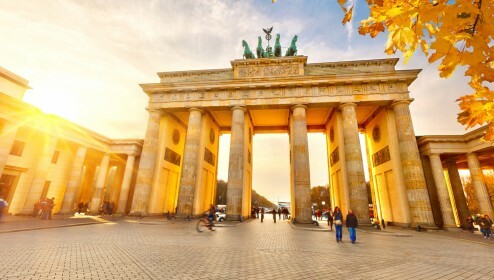 The shortest connection is 3 hours and 30 minutes but with getting to and from the airport you need at least twice that time! 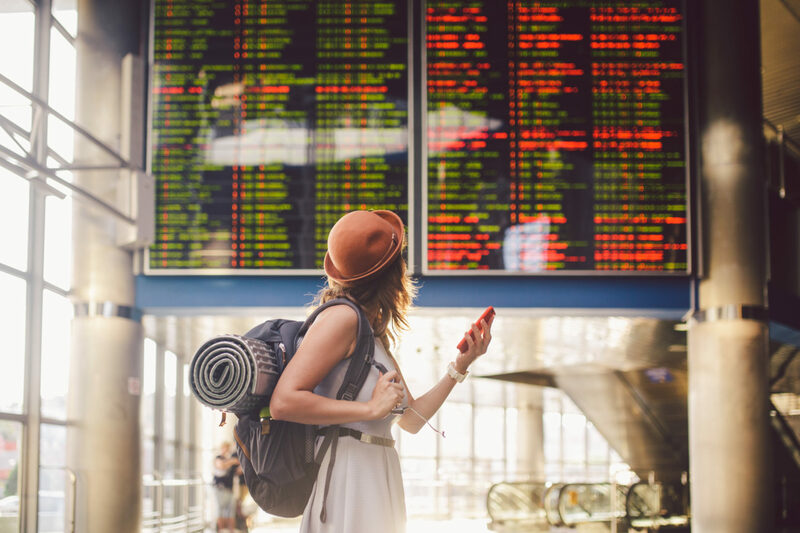 If you are looking for the cheapest connection try to find flights with low cost airlines such as Wizzair or Ryanair with the change in one of the European airports. We recommend this option only to the biggest enthusiast of flying. Train is probably the best way to travel from Budapest to Bratislava. They are frequent (departing every 2 hours), comfortable and take only 2 hours and 30 minutes to get you from one capital to another. In Budapest trains depart from Nyugati station and in Bratislava they arrive to Hlavna Stanica (main train station). Unfortunately currently it is not possible to buy the tickets online, you need to do it the old-fashioned way, at the counter. With the special Europa Expres offer the tickets cost only €9 one way in the second class – the only thing to remember is to buy them a day before the journet at the latest. These trains hardly ever run full so you don’t need to worry about not getting a seat. When taking the Budapest – Bratislava train try to seat on the left side. The views in Hungary when you pass the Danube valley are really beautiful and if you look carefull enough you might see the castle in Visegrad and the impressive basilica in Esztergom. To get to Nyugati train station in Budapest take the metro M3 blue line to the station Nyugati Palyaudvar. In Bratislava the main station is located some 15 minutes walking to the edge of the old town. You can also use public transport – bus no 93 or tram no 1. There is also another, more adventurous way, to take the train. Instead of taking the direct one go to Budapest Kelenfold station from where every hour there’s a train departing to Komarom (for this one you actually can buy the ticket online, at Hungarian railways website. It costs 1680 HUF). This Hungarian town is located 90kms away from Budapest and the journey takes 1 hour and 20 minutes. Once you get out in Komarom you can walk across the bridge on Danube to Komarno – the town on the Slovak side of the border. The train station is located next to the bridge so you can’t miss it. And how often can you just walk freely from one country to another? Since Danube is a fairly wide river you can expect a bit of walking but nothing too exhausting really. 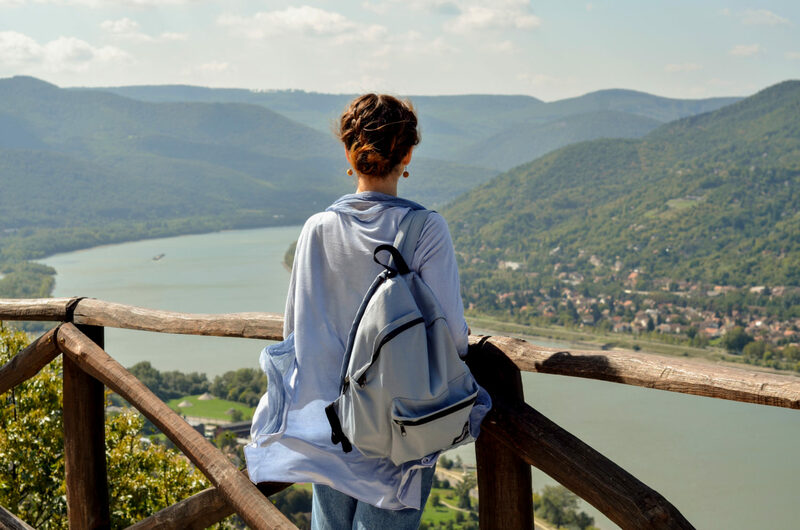 Once you get to the Slovak shore you can either walk directly to the train station (some 2 kms from Danube) or see a bit of the city – all the attractions will be on your right side. 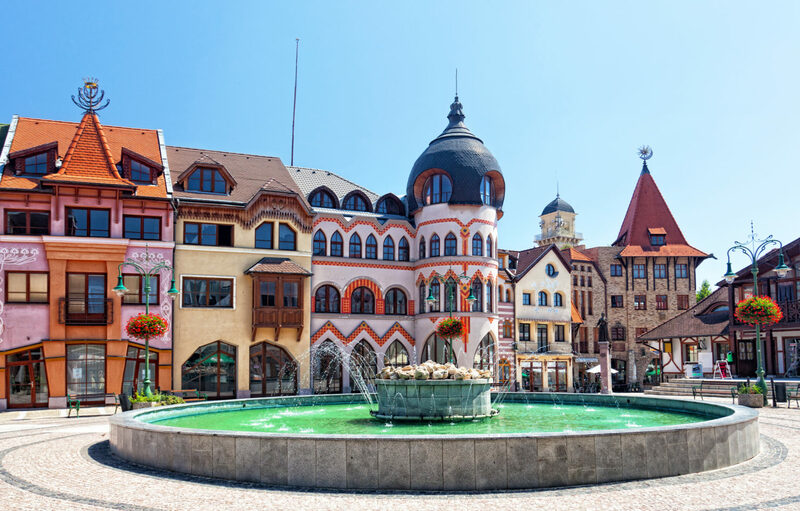 You should especially see Nadvori Evropy – Europe Place – a small square where every building shows the architectonic style from each European Union country. From Komarno you have trains to Bratislava every hour. Aim for those with change in Nove Zamky as these connections are much faster, it takes 1 hour and 25 minutes to get from Komarno to Bratislava – you can get the train tickets online at the website of Slovak railways. Another good option to get from Budapest to Bratislava is bus. Two major companies serving this route are RegioJet and Flixbus. Both offer couple of connections per day with the travel time around 2 hours and 30 minutes. The tickets start at 6,50€, the sooner you buy them the cheaper it gets. No matter which company you choose the journey should be smooth and comfortable. You can buy the tickets online at the website of RegioJet or Flixbus. In Budapest buses depart from Nepliget bus station (the main one, located on the blue M3 metro line, station “Nepliget”) and Kelenfold station (located at the end of the new M4 blue line, station “Kelenfoldi palyaudvar”). In Bratislava they arrive at the central bus station Mlynske Nivy, located some 10 minutes walking from the edge of the old town. There’s no direct public transport between the bus station and the old town. If you would like to see some places along the way but don’t have your car, there is an interesting option to travel from Budapest to Bratislava (or from Bratislava to Budapest) – a sightseeing tour. 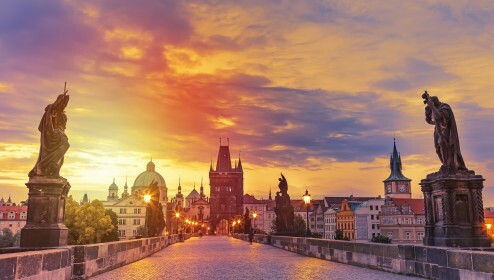 It takes 10 hours, and you will be able to see some less known yet beautiful destinations in Central Europe as well as learn about the region. The tour starts with a stop in Szentendre, a picturesque town just a short ride away from Budapest, with a somehow Mediterranean vibe. From there you will continue to Visegrad where you can admire a breathtaking Danube bend from the hill with the medieval citadel on top. 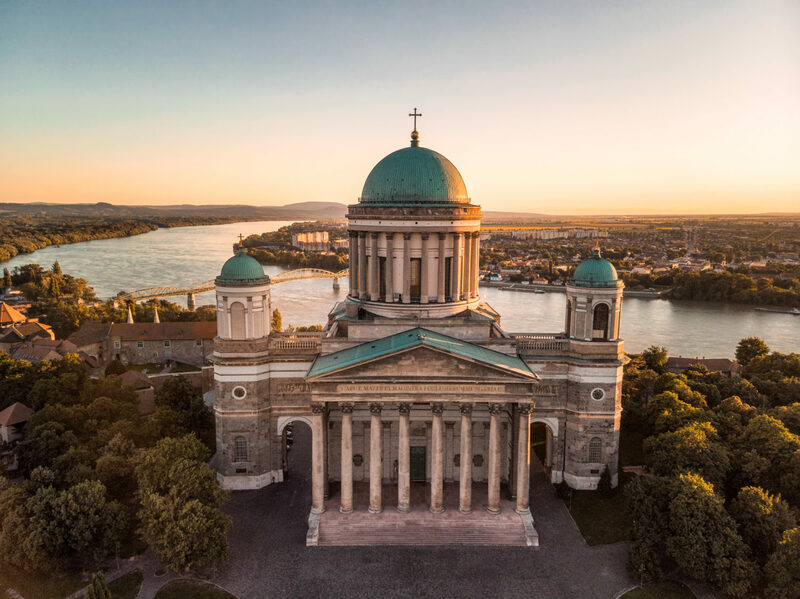 Next stop is in Esztergom where you can see the impressive basilica – the largest one in Hungary. After the lunch break, you will jump across the border to Slovakia and visit Komarno – the town divided by the border with a funky Courtyard of Europe square. Each of the buildings here is built in a different style, showing the diverse architecture of Europe. 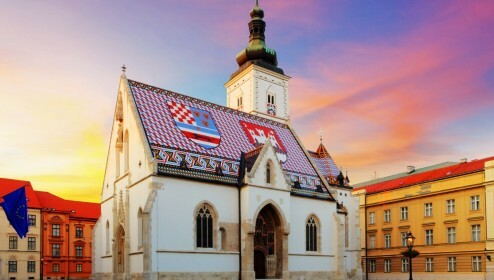 Before heading to Bratislava, you will go back to Hungary to stop in Győr and enjoy a stroll through its picturesque old town with baroque architecture. It will be a busy but fun day, full of incredible views, beautiful places, and great, like-minded company. If you’d like to use a door-to-door private transfer from Budapest to Bratislava you can expect to pay around €140 for the car that can fit up to 4 people. When you travel with a group of friends or family this is certainly a good option as the comfort of the customable transport is so much bigger than with regular public transport connections! Another option worth considering is the share ride. Websites like BlaBlaCar connect drivers with travelers and help finding cheap and comfortable rides. The only thing you need to do is to arrange all the details like pick up time and place with the driver and you’re free to go. Since Budapest to Bratislava route is a rather popular one you shouldn’t have problems with finding a ride. The price starts at €8 but each driver charge whatever they want to, usually not more than €13. 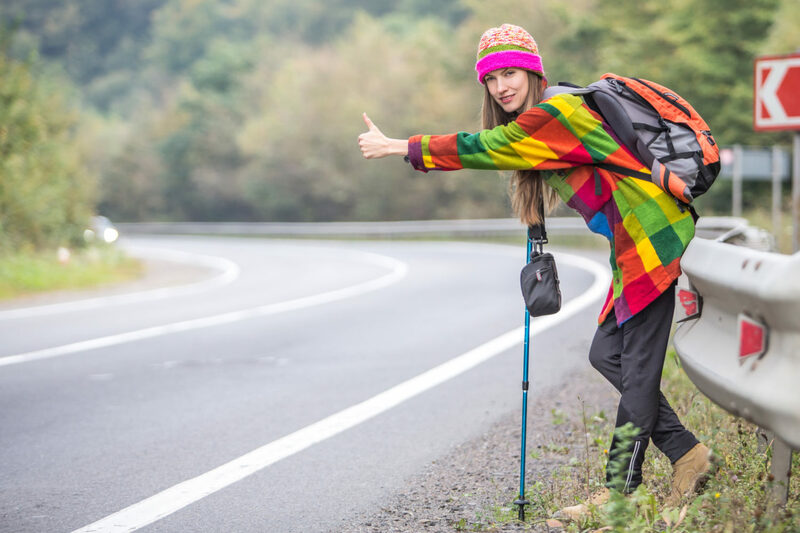 Are you fan of hitchhiking? 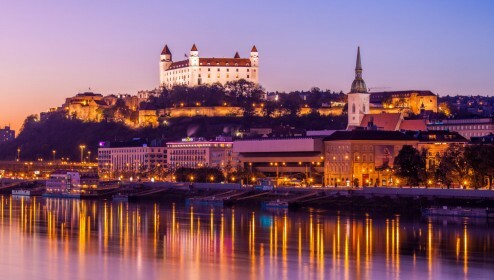 Getting a ride from Budapest to Bratislava shouldn’t be too difficult and you can easily do it in few hours. First you need to go to OMV petrol station BAH-csomópont. It’s easily reachable from the center by buses 8E, 110, 112, 139, 140, 140A or trams 17 and 61. The place is not too far from the heart of Budapest but there are a lot of cars going towards M1 road and that’s what you are looking for. When hitchhiking in the reverse direction you need to get out of the center of Bratislava towards E75 road. The best spot seems to be Zlate piesky petrol station – you can reach it from the center by tram no 4 and then a bit of walking. The journey from Budapest to Bratislava by bike can be a really pleasant experience. It can be done in 2-4 days, depending on how much you’d like to see on the way. 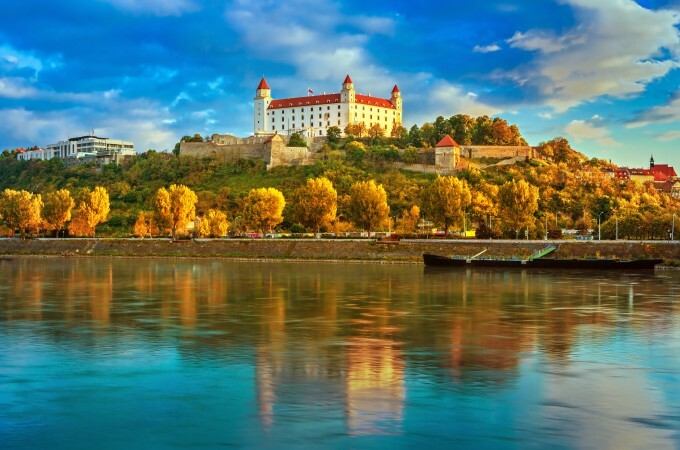 You can go along Danube river and first stop at beautiful Hungarian towns such as Szentendre, Visegrad or Esztregom. Once you cross the border (but still stay at the shore of Danube) you can stop in Komarno to see the already mentioned above Europe Place presenting architecture from all the European Union countries. The landscape is rather flat so going from Budapest to Bratislava by bike shouldn’t be too exhausting. Just like the bike trip from Budapest to Bratislava also walking this route can be a nice way to spend holidays. 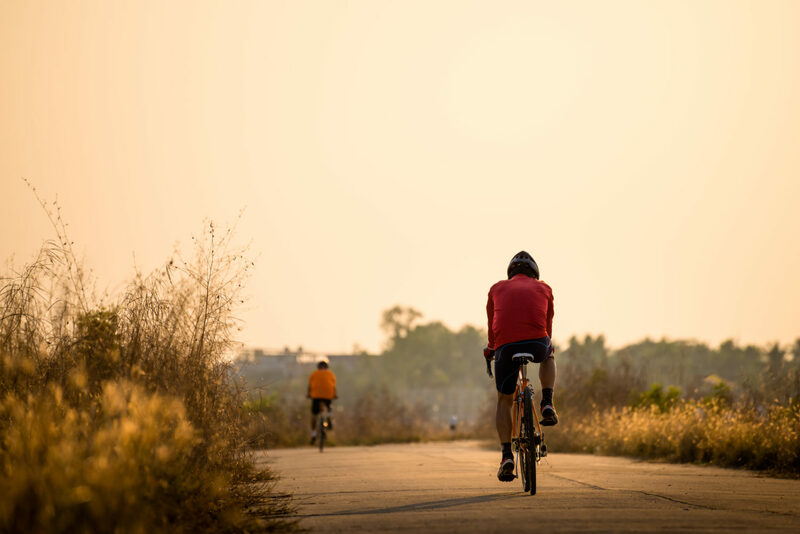 Follow the steps of the above mentioned bike route and you will see some great places along the way and will get a taste of amazing Central Europe! If you’re travelling by car and are not in hurry take a road trip from Budapest to Bratislava! 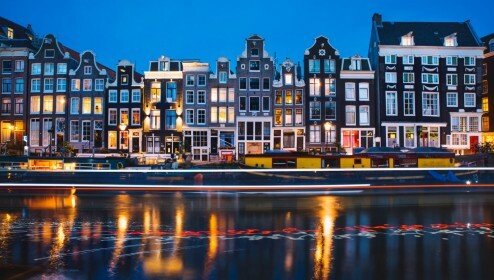 You can spend the whole day visiting few interesting and beautiful places along the way – this can be so much better than just simply driving from one place to another. Start with a stop in Szentendre, known as the most popular day trip from Budapest and one of the most beautiful towns in Central Europe. From there it’s a short ride to Visegrad with the ruins of the Royal Palace located on the hill high above Danube. Another stop should be Esztergom to see the biggest and most important Catholic cathedral in Hungary. Then it’s time to cross the border to Slovakia and visit Komarno with its pleasant center and the Europe Palace. Thanks to the European Union and especially Schengen agreement there is no border control between Hungary and Slovakia so before reaching Bratislava you can easily return to Hungary and have your last stop in Gyor with beautiful baroque architecture and student vibe. 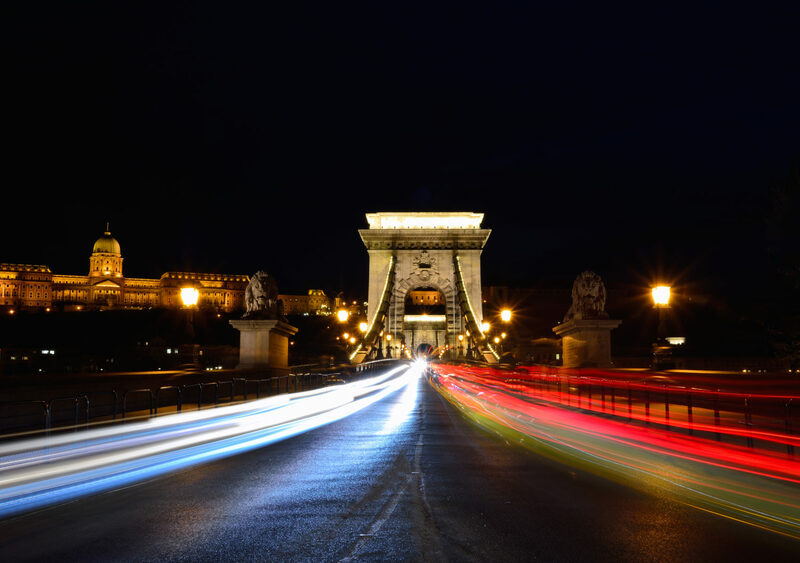 Getting from Budapest to Bratislava is really easy and no matter which option you choose we are sure you will have a good journey! You can buy them at the train station, you might find some travel agencies that sell them as well, but I’m not aware of those. About car rental, I would recommend you to use car renting booking sites like https://www.rentalcars.com for example. You can compare the prices of different companies there and find your best option. But be aware, dropping off in another city & country is quite expensive in Europe. Thank you so much for your invaluable information! Why did you say you need to buy the ticket for the train the day before? I run the risk of not having a ticket on time? 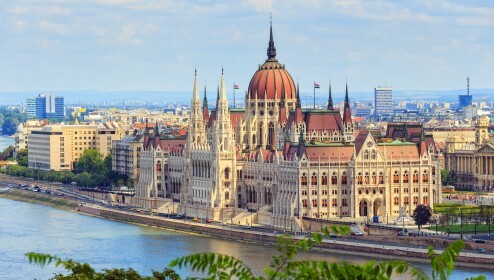 I go from budapest to bratislava on March 2, 2019, a period I believe to be a low season. On the day of departure the tickets are much more expensive, the special price mentioned (that makes the train worth taking) is only if you buy the ticket until the day before the departure. You can buy it on the day of departure but it’s not such a good deal anymore and there might be no seats, depending on the train / day of the journey. Hi, Veronia. I’m not sure, but I think the best way to find it out is ask them directly on their web or buy online. 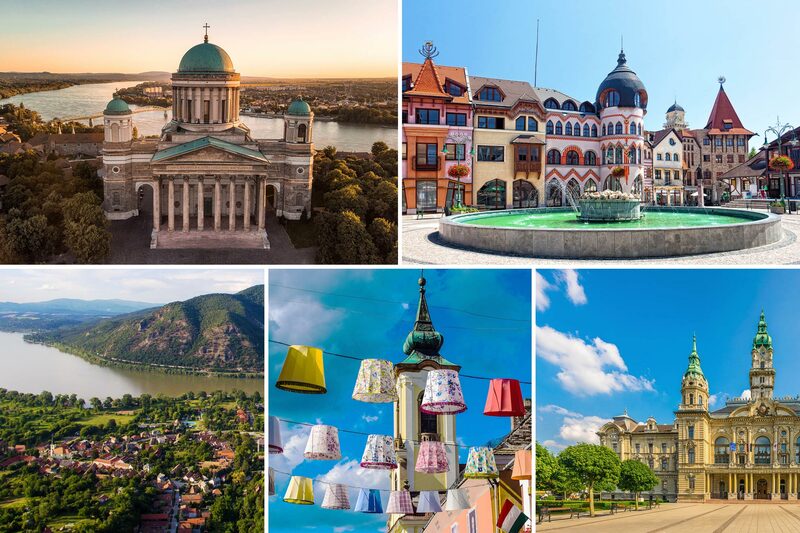 Visit the Danube Bend area, the Basilica of Esztergom and towns of Komarno and Győr on your transfer from Budapest to Bratislava.